Overcoming undesirable single strength juice consistency. Blending offers the opportunity to adjust sugar/acid ratios and compensate for other imbalances in juice from a single harvest or cultivar, since many factors influence the composition and quality of juice (Table 3.1). These differences can be dramatic and complicate the task of a manufacturer committed to a uniform product with established standards. Fortunately, by blending several batches of juice with complementary compositions a uniform, standard juice is practical. Adjusting 100 percent juices is much more of a challenge than manipulating acid and sugar in juice beverage blends. In a similar sense defects in many juice quality or nutritional attributes can be overcome by proper combination of juices. Further adjustments call for additional ingredients. Extremely acidic and/or strong flavoured juices completely mask more subtle juices. In which case, non-juice sweeteners can greatly extend the juice, although labelling regulations must be precisely followed. One of the primary considerations in choosing individual components and preparing juice blends is ºBrix/Acid ratio (°B/A). Depending upon the juices involved this ratio determines the sugar acid balance and influences the perception of each. For example, a 10 percent solution of sucrose is moderately sweet. Adding 1 percent citric acid for a °Brix/A of 10 produces an intensely sour sensation. This solution requires a few percent more sugar before the sensation of sweetness is once again dominant. Certainly, juices are much more complex but °Brix/A remains an important factor. The °Brix/A of some common juices are listed in Table 9.1 It should be emphasized that these figures are quite general, since there are wide ranges among a single species. Even at optimum maturity, ºBrix and acid can vary appreciably. Recent cultivar selection and breeding efforts have decreased acid levels and increased solids (sugars) in some fruits to facilitate fresh eating and juicing. In addition, there are consumer preferences to consider. 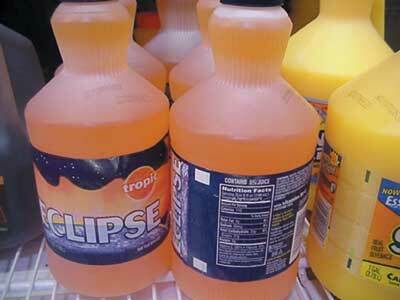 Orange juice at a °Brix/A of 12 is standard in North America, while in the tropics 15 or more is deemed acceptable. Although a given °Brix/A can be obtained by modifying either Brix or acid (or both) juice blends or beverages with less than about 7ºBrix are deemed weak and watery. Those containing more than ~1.2 percent acid are sour, independent of °Brix/A. Table 9.1: ºBrix/Acid ratios of some common fruit juices. Added sweetener may include cane or beet sugar (sucrose), high dextrose equivalent corn syrup, or high fructose corn syrup. The syrups have a cost advantage over sugar in the United States of America. Non or low caloric sweeteners also have a place in juice blending. In this case the °Brix/A is inappropriate and the perceived sweetness must be balanced by trial and error, since the artificial sweeteners contribute little soluble solids and have varying characteristics depending upon the juice mix. An additional concern is the organic acid used to adjust the °Brix/A. Normally the predominant acid naturally present is the best choice, i.e. citric for citrus, malic for apples, tartaric and/or malic for grape. Acetic and lactic which are characteristically associated with fermented vegetable products are rarely used exclusively, although the former along with minor acids such as adipic, succinic, shikimik may contribute to an acid blend. At one time inexpensive bulk juices were deacidified by ion exchange with the colour and flavour removed by activated charcoal. The treated juices were concentrated (removing any surviving aroma) and added simply as sweetener, proclaiming the product as pure 100 percent juice. However, since the treatment essentially removed all original juice character, such material now cannot be labelled as juice, only as natural fruit sugars. These are suitable in "all natural" blends. An ion exchanged "reduced acid" orange juice has recently been introduced to the US market and bears the label `100 percent juice'. 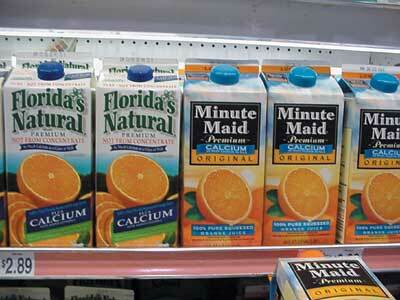 Figure 9.1: Calcium fortified chilled orange juice. In Japan foods for special health use (FOSHU) are an established category and the 1994 United States Dietary Supplement Health and Education Act (DSHEA) opened the door to dietary supplements (Office of Dietary Supplements, 2000). Juices and juice beverages are ideal and popular carriers for both recognized and fringe supplements. In fact, many natural components of juice are now recognized as having phytochemical value and are aggressively promoted in their own right. Blending procedures require careful economic considerations. Depending upon year, location, weather and other factors, juice prices (usually valued as concentrate) can vary by a factor of 2 to 3 over a season. The more desirable and relatively scarce juices such as cranberry, raspberry, blueberry and lesser-known tropicals always have a high price, sometimes up to 100 times more than common juices. Bulk concentrate supplies of generic apple, pear, grape, orange and pineapples are usually readily available in the global market and relatively inexpensive (although premium cultivars demand higher prices). Such juices can serve as a logical blending base for other juices and added ingredients, for example sweeteners, acids, nutrients, preservatives, flavours, colours, etc. It is then up to the juice technologist to creatively blend in more costly juices to achieve the required quality and image. The regulatory aspects are quite important, since all ingredients must be properly identified on the label, along with the total juice percent quantified on a single strength basis (Table 2.2, Figure 2.1). Additionally, there is legislative pressure in some industrialized countries with strong domestic agricultural interests to demand "country of origin" labelling of fresh produce and ingredients, including juice. The economic incentives for blending are persuasive and require careful label reading as well as understanding by the consumer. This is not easy, since juice percentage declarations are inconspicuously printed, compared to promotional material (Figure 9.2). There is no question when a beverage is 100 percent juice as that fact is conspicuously displayed on the label (Figure 2.1). Also, a beverage can have juice as the first ingredient (present in greatest amount) on a single strength basis and still not be the major ingredient on a solids basis. High fructose corn syrup or other added sugars are reported on a concentrated syrup or dry weight basis, thus representing considerably more solids than the juice. Even orange juice with 5 percent sugar added (a common practice in some countries) is actually diluted ~30 percent on a solids basis (12ºBrix from juice and 5ºBrix from sugar). Figure 9.2: Chilled juice beverage label. An average supermarket carries several dozen juices and juice beverages in many sizes, shapes and forms including frozen, refrigerated, shelf stable single strength, concentrate and dried powder (Figures 1.2, 8.2, 8.18 and 17.5). Items range from 100 percent juice to completely artificial, perhaps with some added natural flavourings and colours. The price, single strength equivalent, can vary over 5 fold. Not surprisingly, "100 percent Natural" or "100 percent+" (of specified nutrients) on the label can contain little, if any juice. Nevertheless, there is a certain health and image aura about 100 percent juice products that can be maintained and encouraged by judicious blending of complementary juices and accompanying marketing skills. "Natural" is an effective sales tool, even when the juice technologist can and does improve upon Nature.